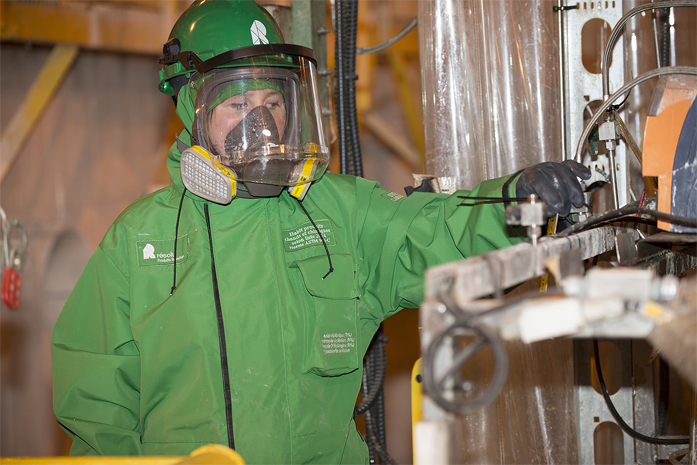 When Paul Falardeau heard it would be several months before the redesigned CarbonX® chemical protective suits would be delivered, the Kénogami mill manager assembled a team and set about finding an alternative. “It didn’t sit well with me because I’d been burned a long time ago when I was 18 years old working in a restaurant,” says Falardeau. So he contacted a local supplier that was making safety suits for Rio Tinto Alcan and began a six-step process to get his team protective suits. The team met with a local supplier to describe their needs and obtained a number of fabric samples to test for heat resistance. To do this, they placed the fabric samples over temperature-measuring sensors and poured hot water from a kettle over the fabric, timing how long it took to get to 60˚C (the contact temperature that produces a first-degree burn). They chose a sample that took nine seconds to reach 60˚C. “If you’re on a ladder or scaffolding and are exposed to dangerous chemicals, nine seconds can give you time to escape safely,” explains Falardeau. The supplier created a prototype made from the fabric selected to give the team a test suit. Some of the chemicals employees are exposed to can leak from pipes under pressure – anywhere from 60 psi to 100 psi. That’s how the team determined the pressure from a fire hose would be a fair approximation of a high pressure leak in a worst case scenario. Several volunteers tested the beta suit’s waterproof rating until, two versions later, the team landed on a watertight design that featured a sealed zipper and a flap. Fire hose tests and team meetings on the mill floor helped to make this project highly visible. By the time Falardeau’s team solicited design suggestions from the different departments, everyone was keen to contribute. The new suit included suggestions such as: pen and walkie-talkie pockets, articulated sleeves to keep arms covered when reaching for overhead valves, pant legs wide enough to allow workers to put on the suit without removing their boots, and extra padding on the knees and elbows. The team did some chemical testing on site, but to meet specific safety standards, it sent the suit to a Quebec testing house to measure splash resistance and to a U.S.-based testing house for chemical permeation tests. All tests were performed using the mill’s four most dangerous chemicals. As with most personal protective equipment, it is important to have a clear policy in place. But at Kénogami, no one needs to be reminded of the importance of their chemical protective suit because most of the employees participated one way or another in its development. The new suits are more comfortable and breathable than some earlier versions, and anyone whose work requires chemical protection gets one. Resolute now offers employees two chemical protective suit alternatives: a CarbonX® suit developed in the U.S. or the STEDAIR® 300 suit developed by the team at Kénogami. While this innovation was designed to help reinforce the safety culture at our mills, the work has not gone unnoticed by the industry. Resolute is beginning to field calls from other forest products companies about these suits.